This How To describes various ways to serve pages optimized for mobile devices from your ASP.NET Web Forms / MVC application, and suggests architectural and design issues to consider when targeting a broad range of devices. This document also explains why the ASP.NET Mobile Controls from ASP.NET 2.0 to 3.5 are now obsolete, and discusses some modern alternatives. For downloadable code samples demonstrating this white paper's techniques for both ASP.NET Web Forms and MVC, see Mobile Apps & Sites with ASP.NET. Mobile devices – smartphones, feature phones, and tablets – continue to grow in popularity as a means to access the Web. For many web developers and web-oriented businesses, this means it's increasingly important to provide a great browsing experience for visitors using those devices. ASP.NET versions 2.0 to 3.5 included ASP.NET Mobile Controls: a set of server controls for mobile devices in the System.Web.Mobile.dll assembly and the System.Web.UI.MobileControls namespace. The assembly is still included in ASP.NET 4, but it is deprecated. Developers are advised to migrate to more modern approaches, such as those described in this paper. The reason why ASP.NET Mobile Controls have been marked as obsolete is that their design is oriented around the mobile phones that were common around 2005 and earlier. The controls are mainly designed to render WML or cHTML markup (instead of regular HTML) for the WAP browsers of that era. But WAP, WML, and cHTML are no longer relevant for most projects, because HTML has now become the ubiquitous markup language for mobile and desktop browsers alike. Screen size - Mobile devices vary dramatically in form, and their screens are often much smaller than desktop monitors. So, you may need to design completely different page layouts for them. Input methods – Some devices have keypads, some have styluses, others use touch. You may need to consider multiple navigation mechanisms and data input methods. Bandwidth – Cellular data network performance varies wildly, and some end users are on tariffs that charge by the megabyte. There's no one-size-fits-all solution; your application will have to look and behave differently according to the device accessing it. Depending on what level of mobile support you want, this can be a bigger challenge for web developers than the desktop "browser wars" ever was. Developers approaching mobile browser support for the first time often initially think it's only important to support the latest and most sophisticated smartphones (e.g., Windows Phone 7, iPhone, or Android), perhaps because developers often personally own such devices. However, cheaper phones are still extremely popular, and their owners do use them to browse the web – especially in countries where mobile phones are easier to get than a broadband connection. Your business will need to decide what range of devices to support by considering its likely customers. If you're building an online brochure for a luxury health spa, you might make a business decision only to target advanced smartphones, whereas if you're creating a ticket booking system for a cinema, you probably need to account for visitors with less powerful feature phones. Do nothing – You can simply create a standard, desktop-oriented web application, and rely on mobile browsers to render it acceptably. The latest smartphones may render your HTML just as well as a desktop browser, but users will still be forced to zoom and scroll horizontally and vertically to consume your content on a small screen. This is far from optimal. Older devices and feature phones may fail to render your markup in a satisfactory way. Even on the latest tablet devices (whose screens can be as big as laptop screens), different interaction rules apply. Touch-based input works best with larger buttons and links spread further apart, and there's no way to hover a mouse cursor over a fly-out menu. Solve the problem on the client – With careful use of CSS and progressive enhancement you can create markup, styles, and scripts that adapt to whatever browser is running them. For example, with CSS 3 media queries, you could create a multi-column layout that turns into a single column layout on devices whose screens are narrower than a chosen threshold. Disadvantage: Mobile devices are so different from desktop devices that you may really want your mobile pages to be completely different from your desktop pages, showing different information. Such variations can be inefficient or impossible to achieve robustly through CSS alone, especially considering how inconsistently older devices interpret CSS rules. This is particularly true of CSS 3 attributes. Disadvantage: Provides no support for varying server-side logic and workflows for different devices. You can't, for example, implement a simplified shopping cart checkout workflow for mobile users by means of CSS alone. Disadvantage: Inefficient bandwidth use. You server may have to transmit the markup and styles that apply to all possible devices, even though the target device will only use a subset of that information. Solve the problem on the server – If your server knows what device is accessing it – or at least the characteristics of that device, such as its screen size and input method, and whether it's a mobile device – it can run different logic and output different HTML markup. Advantage: Maximum flexibility. There's no limit to how much you can vary your server-side logic for mobiles or optimize your markup for the desired, device-specific layout. Advantage: Efficient bandwidth use. You only need to transmit the markup and styling information that the target device is going to use. Disadvantage: Sometimes forces repetition of effort or code (e.g., making you create similar but slightly different copies of your Web Forms pages or MVC views). Where possible you will factor out common logic into an underlying layer or service, but still, some parts of your UI code or markup may have to be duplicated and then maintained in parallel. Disadvantage: Device detection is not trivial. It requires a list or database of known device types and their characteristics (which may not always be perfectly up-to-date) and isn't guaranteed to accurately match every incoming request. This document describes some options and their pitfalls later. Is it a mobile device? It's better to make decisions based on characteristics than model number, because then you'll be better equipped to handle future devices. Behind the scenes, the ASP.NET platform matches the incoming User-Agent (UA) HTTP header against regular expressions in a set of Browser Definition XML files. By default the platform includes definitions for many common mobile devices, and you can add custom Browser Definition files for others you wish to recognize. For more details, see the MSDN page ASP.NET Web Server Controls and Browser Capabilities. You want to recognize the latest devices(without manually creating Browser Definition files for them). Note that .NET 4's Browser Definition files are not recent enough to recognize Windows Phone 7, Android phones, Opera Mobile browsers, or Apple iPads. You need more detailed information about device capabilities. You may need to know about a device's input method (e.g., touch vs keypad), or what audio formats the browser supports. This information isn't available in the standard Browser Definition files. The Wireless Universal Resource File (WURFL) project maintains much more up-to-date and detailed information about mobile devices in use today. The great news for .NET developers is that ASP.NET's browser detection feature is extensible, so it's possible to enhance it to overcome these problems. For example, you can add the open source 51Degrees.mobi Foundation library to your project. It's an ASP.NET IHttpModule or Browser Capabilities Provider (usable on both Web Forms and MVC applications), that directly reads WURFL data and hooks it into ASP.NET's built-in browser detection mechanism. Once you've installed the module, Request.Browser will suddenly contain a lot more accurate and detailed information: it will correctly recognize many of the devices previously mentioned and list their capabilities (including additional capabilities such as input method). See the project's documentation for more details. Clearly, neither layout looks very mobile-friendly – this page was designed for a large, landscape-oriented monitor, not for a small portrait-oriented screen. So what can you do about it? As discussed earlier in this paper, there are many ways to tailor your pages for mobile devices. Some techniques are server-based, others run on the client. Depending on your requirements, you may be able to use the same Web Forms for all visitors, but have two separate master pages: one for desktop visitors, another for mobile visitors. This gives you the flexibility of changing the CSS stylesheet or your top-level HTML markup to suit mobile devices, without forcing you to duplicate any page logic. Now, create a master page called Mobile.Master in the top-level folder of your application, and it will be used when a mobile device is detected. Your mobile master page can reference a mobile-specific CSS stylesheet if necessary. Desktop visitors will still see your default master page, not the mobile one. For maximum flexibility, you can go much further than just having separate master pages for different device types. You can implement two totally separate sets of Web Forms pages – one set for desktop browsers, another set for mobiles. This works best if you want to present very different information or workflows to mobile visitors. The rest of this section describes this approach in detail. Assuming you already have a Web Forms application designed for desktop browsers, the easiest way to proceed is to create a subfolder called "Mobile" within your project, and build your mobile pages there. You can construct an entire sub-site, with its own master pages, style sheets, and pages, using all the same techniques that you'd use for any other Web Forms application. You don't necessarily need to produce a mobile equivalent for every page in your desktop site; you can choose what subset of functionality makes sense for mobile visitors. Since this approach usually involves some duplication of code (mobile pages are likely to share some similarities with desktop pages), it's important to factor out any common business logic or data access code into a shared underlying layer or service. Otherwise, you'll double the effort of creating and maintaining your application. You can then easily allow mobile visitors to access your desktop pages if they wish – just put a link on your master page that goes to "Desktop version". The visitor won't be redirected back to a mobile page, because it's no longer the first request in their session. This code assumes your page has a Login server control called LoginUser, as in the default project template. If you're using output caching, beware that by default it's possible for a desktop user to visit a certain URL (causing its output to be cached), followed by a mobile user who then receives the cached desktop output. This warning applies whether you're just varying your master page by device type, or implementing totally separate Web Forms per device type. This will ensure that mobile visitors to the page don't receive output previously put into the cache by a desktop visitor. For more tips about optimizing your markup and CSS for mobile browsers, see the section "Styling mobile pages for mobile browsers" later in this document. Use the same controllers and views for both desktop and mobile browsers, but render the views with different Razor layouts depending on the device type. This option works best if you're displaying identical data on all devices, but simply want to supply different CSS stylesheets or change a few top-level HTML elements for mobiles. 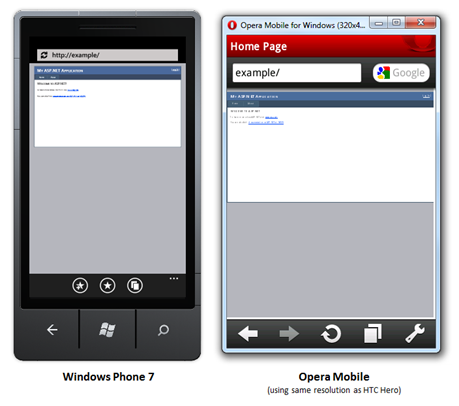 Use the same controllers for both desktop and mobile browsers, but render different views depending on the device type. This option works best if you're displaying roughly the same data and providing the same workflows for end users, but want to render very different HTML markup to suit the device being used. Create separate areas for desktop and mobile browsers, implementing independent controllers and views for each. This option works best if you're displaying very different screens, containing different information and leading the user through different workflows optimized for their device type. It may mean some repetition of code, but you can minimize that by factoring out common logic into an underlying layer or service. Layout = Request.Browser.IsMobileDevice ? "~/Views/Shared/_LayoutMobile.cshtml"
Now you can create a mobile-specific layout called _LayoutMobile.cshtml with a page structure and CSS rules optimized for mobile devices. If you want to take the second option render totally different views according to the visitor's device type, see Scott Hanselman's blog post. The rest of this paper focuses on the third option – creating separate controllers and views for mobile devices – so you can control exactly what subset of functionality is offered for mobile visitors. You can add an area called "Mobile" to an existing ASP.NET MVC application in the normal way: right-click on your project name in Solution Explorer, then choose Add à Area. You can then add controllers and views as you would for any other area within an ASP.NET MVC application. For example, add to your Mobile area a new controller called HomeController to act as a homepage for mobile visitors. // By default there is no "controller" parameter in the following line. // Add one referencing "Home" as shown. This means the mobile homepage will now be located at /Mobile, rather than /Mobile/Home, because "Home" is now the implicitly default controller name for mobile pages. Now the error will go away, and the URL http://yoursite/ will reach the desktop homepage, and http://yoursite/mobile/ will reach the mobile homepage. The downloadable sample included with this white paper includes an implementation of this logic. It's implemented as an authorization filter, derived from AuthorizeAttribute, which means it can work correctly even if you are using output caching (otherwise, if a desktop visitor first accesses a certain URL, the desktop output might be cached and then served to subsequent mobile visitors). Register a global filter as shown above that sends mobile visitors to the mobile homepage by default. Also apply a special [RedirectMobileDevicesToMobileProductPage] filter to a "view product" action that takes mobile visitors to the mobile version of whatever product page they had requested. If you're using Forms Authentication, you should note that when a user needs to log in, it automatically redirects the user to a single specific "log on" URL, which by default is /Account/LogOn. This means that mobile users may be redirected to your desktop "log on" action. … and then implement a suitable mobile-specific "log on" action on a controller called AccountController in your Mobile area. To see these techniques in action, download this white paper's code associated samples. The sample includes an ASP.NET MVC 3 (Release Candidate) application enhanced to support mobile devices using the methods described above. The following discussion applies both to Web Forms and MVC developers who are using the techniques covered in this document. The redirection logic shown in this document may be perfectly sufficient for your application, but it won't work if you need to disable sessions, or with mobile browsers that reject cookies (these can't have sessions), because it won't know whether a given request is the first one from that visitor. You already learned how the open source 51Degrees.mobi Foundation can improve the accuracy of ASP.NET's browser detection. It also has a built-in ability to redirect mobile visitors to specific locations configured in Web.config. It's able to work without depending on ASP.NET Sessions (and hence cookies) by storing a temporary log of hashes of visitors' HTTP headers and IP addresses, so it knows whether or not each request is the first one from a given vistor. The following element added to the fiftyOne section of the web.config file will redirect the first request from a detected mobile device to the page ~/Mobile/Default.aspx. Any requests to pages under the Mobile folder will not be redirected, regardless of device type. If the mobile device has been inactive for a period of 20 minutes or more the device will be forgotten and subsequent requests will be treated as new ones for the purposes of redirection. For more details, see 51degrees.mobi Foundation documentation. You can use 51Degrees.mobi Foundation's redirection feature on ASP.NET MVC applications, but you will need to define your redirection configuration in terms of plain URLs, not in terms of routing parameters or by putting MVC filters on actions. This is because (at the time of writing) 51Degrees.mobi Foundation does not recognize filters or routing. Since most web pages were designed for large desktop-sized screens and fast fixed-line broadband connections, many operators use transcoders or proxy servers that dynamically alter web content. They may modify your HTML markup or CSS to suit smaller screens (especially for "feature phones" that lack the processing power to handle complex layouts), and they may recompress your images (significantly reducing their quality) to improve page delivery speeds. The resulting HTTP message informs W3C compliant transcoders and proxies not to alter content. Of course, there is no guarantee that mobile network operators will respect this message. It's beyond the scope of this document to describe in great detail what kinds of HTML markup work correctly or which web design techniques maximize usability on particular devices. It's up to you to find a sufficiently simple layout, optimized for a mobile-sized screen, without using unreliable HTML or CSS positioning tricks. One important technique worth mentioning, however, is the viewport meta tag. Certain modern mobile browsers, in an effort display web pages meant for desktop monitors, render the page on a virtual canvas, also called "viewport" (e.g., the virtual viewport is 980 pixels wide on iPhone, and 850 pixels wide on Opera Mobile by default) and then scale the result down to fit onto the screen's physical pixels. The user can then zoom in and pan around that viewport. This has the advantage that it lets the browser display the page in its intended layout, but it's also has the disadvantage that it forces zooming and panning, which is inconvenient for the user. If you're designing for mobile, it's better to design for a narrow screen so that no zooming or horizontal scrolling is necessary. … then supporting smartphone browsers will lay out the page on a 480-pixel wide virtual canvas. This means that if your HTML elements define their widths in percentage terms, the percentages will be interpreted with respect to this 480-pixel width, not the default viewport width. As a result, the user is less likely to have to zoom and pan horizontally – considerably improving the mobile browsing experience. For this to work correctly, you must not explicitly force elements to exceed that width (e.g., using a width attribute or CSS property), otherwise the browser will be forced to use a larger viewport regardless. See also: more details about the nonstandard viewport tag. Most modern smartphones support dual orientation: they can be held in either portrait or landscape mode. So, it's important not to make assumptions about the screen width in pixels. Don't even assume that the screen width is fixed, because the user can re-orient their device while they are on your page. Older Windows Mobile and Blackberry devices may also accept the following meta tags in the page header to inform them content has been optimized for mobile and therefore should not be transformed. 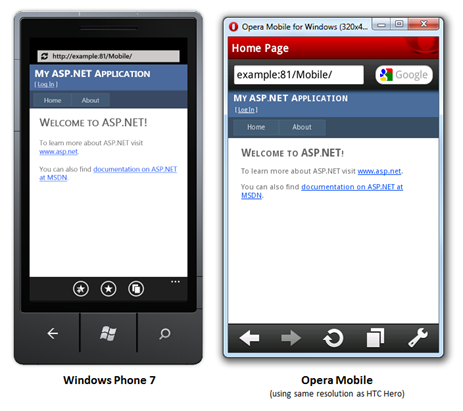 For a list of mobile device emulators and simulators you can use to test your mobile ASP.NET web application, see the page Simulate popular mobile devices for testing.